The exhilaration of writing is met with the fear of leaping into uncertainty. 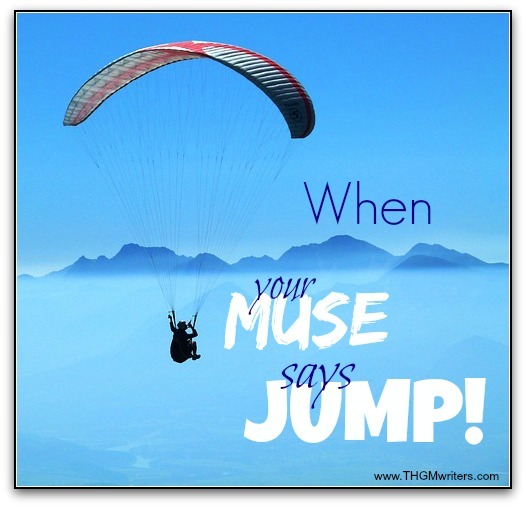 Listen to your muse and jump when she says to. Wake up. Feel grateful for working as a writer. Let’s get a little deep today, shall we? Read the rest of the blog post. Many people also want to avoid uncertainty like cliches, MRSA and the tax man, even though to misquote Buddha, all life is uncertainty, as we argued a while back. Uncertainty is staring up at a mountain (of deadlines, perhaps) and thinking that you only brought a pair of long underwear and an oxygen mask in preparation for climbing K2 or Mount Everest. Writer: Come to me, Muse, speak your wisdom. What should I do? Muse: See (name of client) at the mountain. (Client) is reaching out to you. Do you see? Writer: (Client) is high on a distant peak in the snow, like a tiny figure midway up the mountain. Muse: (Client) is letting down a golden ladder for you. Writer: The climb is sheer and steep. Muse: Take the ladder (Client) offers. Muse: Make a harness and propel yourself upward. Writer: I’m scared. It’s cold. The mountain is too high. Writer: God. I am at the roof of the world. Writer: That’s my past, all the projects I’ve worked on, the struggles, the setbacks and triumphs. Muse: Do you see the pink and purple cord around your waist? Muse: You will already be connected to your safe place. Writer: I’m wondering if I can be a Sherpa. Writer: We’re on a mountain, but okay. Writer: Wow, I’m up here with you and (Client). Muse: How does it feel? Writer: My heart is double-time. Writer: I do. I want this. Yes! Did the writer truly jump? Did the writer take the summit and the freedom? What happened when the writer led the client back down the mountain? You finish the story. It is, after all, your story. You can write your own ending. That’s a great idea, Kristin. I am sure there are a few interesting stories we could ply out of even some successful writers with the right lubricant. Maybe you need a magnifying glass or a telescope> Who knows where he has wandered off to.